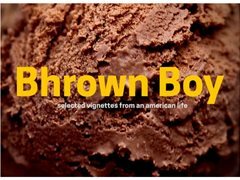 Bhrown Boy is a short film based around the experiences of growing up in Australia in the 21st century and how high school culture is affected by Americanisation and racism. The film focuses on one boy and his life in high school and at home growing up with brown skin and how he deals with pressures of life. Shooting in September with rehearsals in the weeks/months before. Rhavin is the main character of the film. Timid and unsure of his place in the world, a bit shy but also quite switched on to the world. He wants people to like him and tries his best to fit in. He has a good heart even if he doesn't always make the right choices. The mother of the lead character, kind and caring but doesn't fully understand her son. She is rooted in the traditions of her home country of Sri Lanka and doesn't understand why her son doesn't appreciate them too. Matteo is a confident and funny Italian-Australian high school student who likes to make his friends laugh, sometimes through inappropriate jokes. He's bold and brash and doesn't really seem to care what he's saying even if its a bit rude. The best friend of the main character, he talks a lot about the world from his perspective. Leah is a smart high school student who likes to discuss the world and society with her friends. Chinese-Australian high school student, enjoys joking around with his friends and making crass jokes. He's a friend of the main character and is mostly comfortable in his skin. Tayla is a smart high school student who likes to talk about politics and society with her friends. Liam is a confident high school student who jokes about with his friends and swears a bit too much. Lachlan is a very athletic and handsome high school student, both the class clown and ladies man of the school. He likes to make jokes at others expense. Mrs Gelder is a young attractive teacher, the crush of many of the boys at the school. Ms Toll is an old high school teacher with a very raspy voice, she is quite strict but gets quite confused in her old age. She inadvertently says inappropriate things. A very attractive blonde high school student, very popular and the main romantic interest of the main character. A well respected and liked high school teacher. Funny but doesn't lose his grip over the students. An old and confused Indian man who doesn't speak much english and asks the main character for help. A Chinese shopkeeper with a thick Chinese accent. High school student and class mate of the main character. A crass and rude high school student who makes a lot of inappropriate jokes and comments. Chats a lot with his friends about girls.